The best thing about documentaries is that it either is teaches you about something you didn’t already know, or concisely lays out a subject matter that you know about but in a way that still really perks your interest. 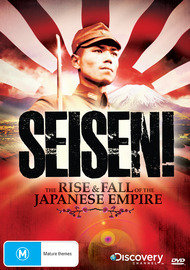 So when I had the chance to review this DVD, I knew that I had some knowledge about Japan during World War 2, but I had a feeling this was going to open up so much more that I didn’t know about at all. This was an awesome documentary! It told the story of around 50 years in history, but still did it in a really concise way, so you never felt it went to wide, and you could easily grasp the whole story it was trying to tell. And like any good documentary, it taught me stuff I had never known about, and opened my eyes and changed my opinions on other things I thought I knew about.